The Maruti Suzuki Ertiga was an MPV success story that many manufacturers only hoped to emulate. It was spacious enough for joint families, came with a set of frugal engines and didn't hurt the wallet when it came to maintenance; qualities that made it a popular people mover. 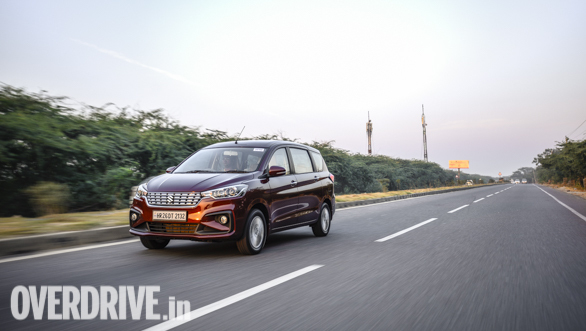 Cut to 2018 and Maruti Suzuki has introduced the all-new Ertiga that promises to elevate the MPV experience. 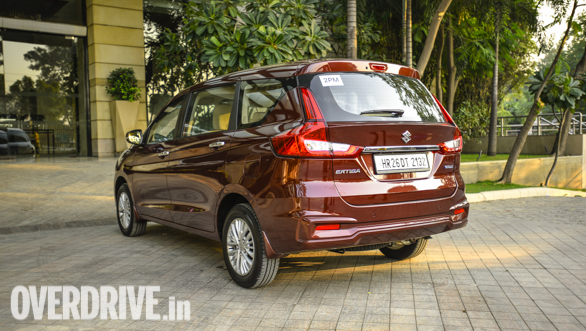 At first glance, the new Ertiga looks stylish and premium. The sleek projector headlamps, for instance, merge with the thick chrome grille to lend an appearance of a wide car. Then there's the raised bonnet that has well-defined crease lines and the body coloured fangs above the fog lamps lend an SUVish flavour to the design. Move to the side, however, and the MPV silhouette is evident, but that's not to say that it's boring. The prominent crease line that begins from the front fender, extends all the way to the wrap around tail lamps. It adds some flair to what would've otherwise been a slab sided profile. The blacked out C-pillar also gives an impression of a floating roof, a design idea that's beginning to appear on cars with thick D-pillars. The tail section is tastefully executed as well. A pair of Volvo V90 Cross Country style LED tail lamps are connected by a fat slab of chrome. 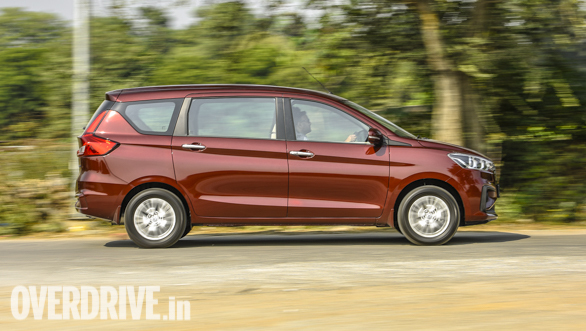 In all, the new Ertiga looks upmarket and that drives up its aspirational quotient. The only gripe I've got with the design is the undertyred look. The multi-spoke 15- inch alloy wheels shod with 185 section tyres don't fill up the wheel arches enough. A set of 16 or 17 inch rims would've looked much nicer. As with the exterior, the cabin has improved by leaps. What immediately catches your attention is the elegant dashboard. The beige and grey colours and a chunky strip of satin finished faux wood running across it exudes a premium feel. 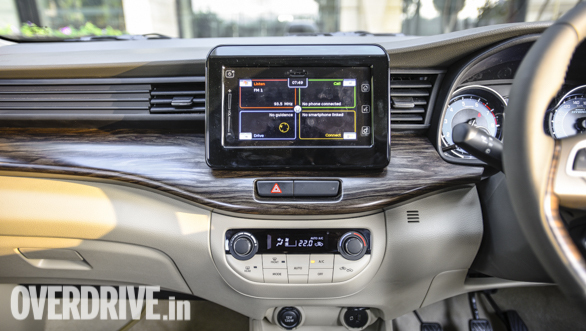 The Z+ variants get a crisp 17.8cm touchscreen display with Apple CarPlay and Android Auto, similar to what we've seen in other Marutis such as the Swift or Ciaz. 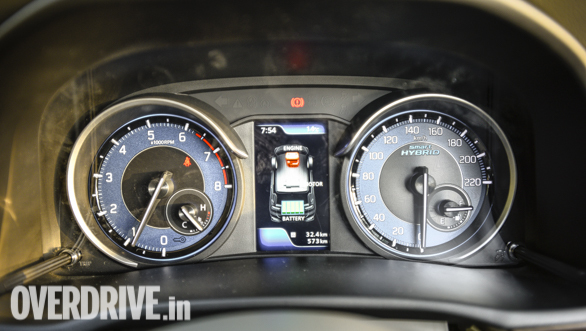 The instrument cluster features a simple layout with cool blue dials that flank a colour TFT multi-information display (MID), available in the petrol models only. Besides the usual trip, odometer and efficiency data, it also displays an animation of the how the Smart Hybrid system works. 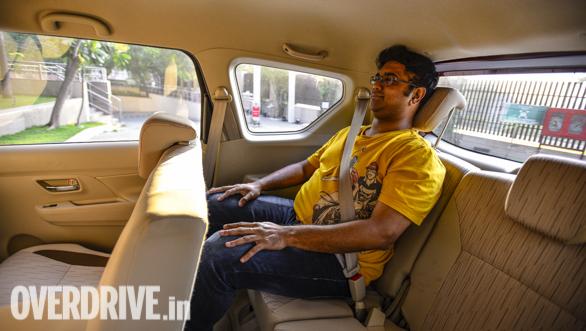 Hopping onto the Heartect platform has resulted in an Ertiga that's longer, taller and wider than the previous car. And that translates to increased cabin space. While the second row of seats (with standard ISOFIX mounts), can be moved forward or backward for adequate knee room, the 50:50 split third row seats can be reclined. There's more legroom in the last row to accomodate two adults. That said, I'm 5ft 10inches and my head touches the roof line while seated in the third row. So, as is the case with most MPVs, the space in the last row is best suited for children, or adults over short trips. 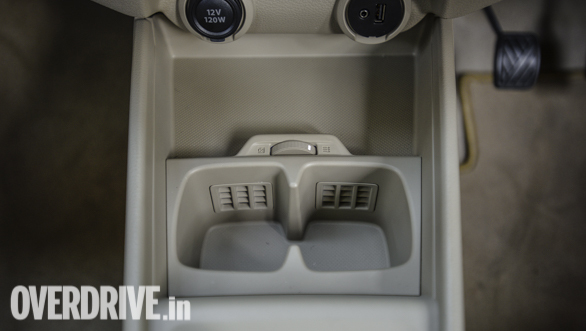 Maruti has also addressed a complaint we had with the previous Ertiga - boot space. There's 209 litres of luggage space with the third row in place, enough to store two small suitcases. Drop the last row and boot volume goes up to 550 litres. Now since this is a people mover, there are some thoughtful storage areas around the cabin. There are bottle holders for all passengers, including chilled cup holders in the center console that also has a recess to keep your phone. 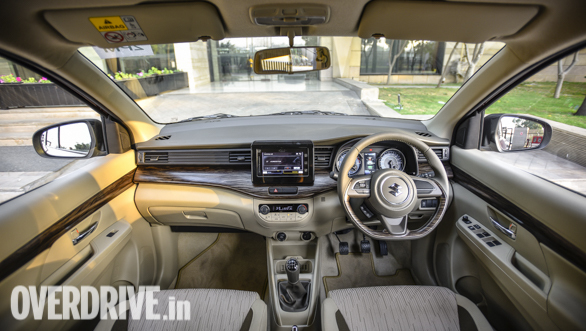 The overall fit and finish is on par with what we've seen in new age Maruti Suzukis and there's nothing to complain of. 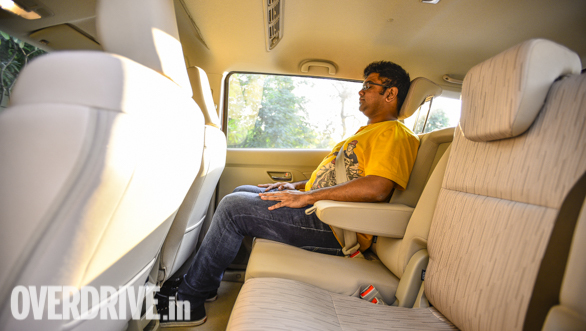 The Ertiga gets two engine options, one diesel and one petrol, paired to a five-speed manual transmission. The VXi and ZXi petrol variants are also available with a four-speed automatic transmission. The 1.3-litre DDiS 200 90PS/200Nm diesel motor has been a Maruti Suzuki staple for years. But it's the petrol motor that's the talking point. 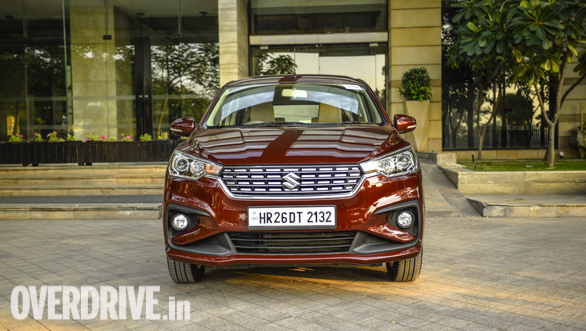 It's the same 105PS/ 138Nm, 1.5-litre motor with a Smart Hybrid system that debuted in the 2018 Maruti Suzuki Ciaz. The clever setup uses a lithium ion battery (located under the front passenger seat) to power a motor that in-turn powers the front wheels before the engine's torque begins to kick in, as the revs rise. So, effectively, the system acts as torque fill at low revs, allowing you to cruise at low speeds in high gears. This also improves driveability in the city, and you can comfortably potter around 30-40kmph in fourth. A quick overtake in such a scenario only requires a little flex of the accelerator pedal for the Ertiga to surge ahead. Without the system, you'd have to downshift and raise the revs beyond 3-4,000rpm to gain momentum, a typical shortcoming of naturally aspirated petrols. This kind of driveability as well as idle stop/start and low rolling resistance Bridgestone Ecopia tyres is what contributes to improved fuel economy, something that we'll verify once we road test the car. As far as refinement levels are concerned, the petrol motor is smooth at low revs but it does get a bit vocal past 4,500rpm. The NVH also wasn't great as there's plenty of road and wind noise beyond 80kmph. The benefits of the new Heartect platform shine in this department as well. 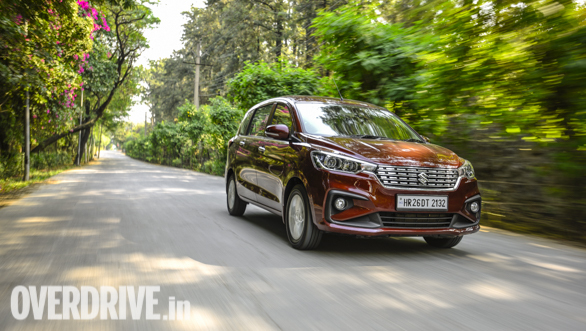 There's a lovely suppleness to the ride and the Ertiga remained composed through undulations and the couple of potholes that we could find on our test route. Handling too is predictable and confidence inspiring. 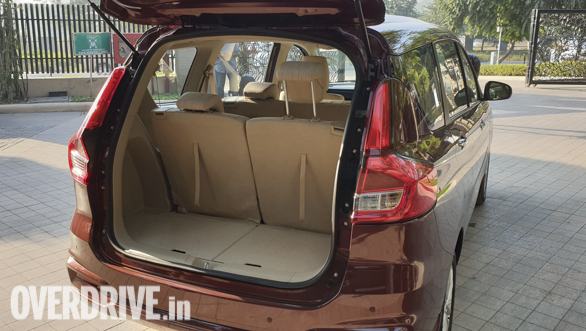 The Ertiga remained planted through a few set of corners we encountered with only a hint of body roll. The steering, though a tad vague at low speeds, weighs up beautifully as the pace rises, again encouraging you to chuck the MPV in a corner. The brakes offer strong bite and the standard ABS helps you rely on them. 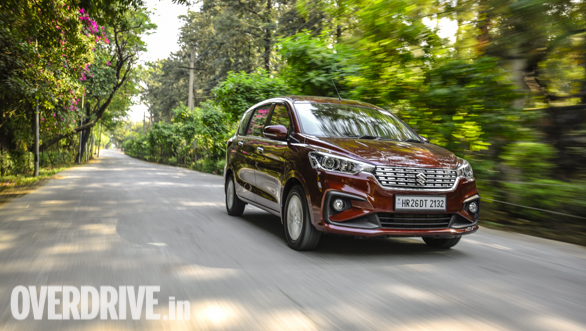 The new Ertiga is a very well-rounded product that betters its established and successful predecessor in more ways than one. It looks good, feels premium and is well-equipped. 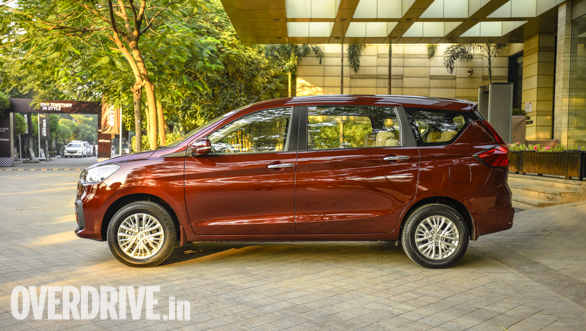 The hybrid engines is the cherry on top of the cake and as an overall package, the Ertiga offers great value, with prices starting at Rs 7.44 lakh (ex-showroom).